Fleeing the rural life of her traditional French Catholic family, Suzanne Meloche heads for Montréal, and falls into company with the Automatists, a group of avante-garde artists and activists centred on Paul-Émile Borduas. She writes poetry, and she paints, and she will marry one of Borduas’ disciples, the painter Marcel Barbeau, and have two children by him. But motherhood and marriage will weigh her down, until she runs away once again, leaving her children behind. 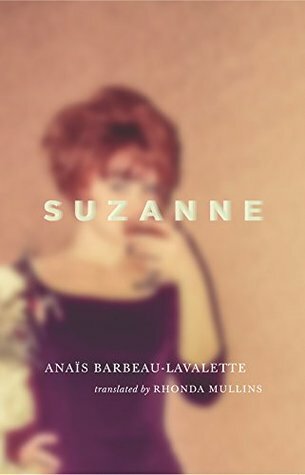 In Suzanne, Anaïs Barbeau-Lavalette attempts to make sense of the life of her grandmother, a woman she never really knew, but whose choices sent profound ripples down through the generations of her descendants. To her, she was simply the woman who abandoned her mother, but in writing the biographical novel of her life, she reveals her grandmother to be that, and so much more. Anaïs Barbeau-Lavalette’s biographical novel of her grandmother’s life was published in French in 2015 as La femme qui fuit, or The woman who flees, it has been translated into English by Rhonda Mullins, who was also the translator of 2015 Canada Reads contender And the Birds Rained Down by Jocelyne Saucier. Suzanne is, rather unusually, largely told in the second person, the author dictating her grandmother’s actions back to her, a mode that feels simultaneously interrogative and perhaps somewhat impertinent. A quick look at the original French confirmed my suspicion that Barbeau-Lavalette writes of her grandmother using the more informal, less respectful “tu” rather than the more formal, or respectful “vous” pronoun. She is at once trying to get closer to her, and denying her the deference usually conveyed upon an elder. She approaches the woman and her legacy defensively, still nursing the hurt done to her own beloved mother. On the other side, Barbeau-Lavallette seems to have little curiosity or attention for her grandfather, Marcel, who agreed to terminate his parental rights so that Suzanne could place the children for adoption. Prior to the termination, he had left Suzanne alone in a farmhouse with two young children, while he travelled to New York to pursue his artistic career. Perhaps somewhat unfairly, it is Suzanne who, as a mother and a woman, bears the brunt of judgement for this abandonment. Barbeau-Lavallette’s mother, Manon, would be raised by her paternal aunts, but her uncle was adopted out and raised by strangers. Marcel largely disappears from the pages when he and Suzanne go their separate ways, but he was still alive when La femme qui fuit was published, and Barbeau-Lavallette thanks him in the acknowledgements. Suzanne is defended on the Canada Reads 2019 debates by actor Yanic Truesdale. The questions on Day Two focused on the quality of the writing and the immersiveness of setting in the remaining four books. Lisa Ray lauded Suzanne’s lyrical writing, and said that it was the only book besides her own that moved her to tears. Perhaps surprisingly, none of the panelists seemed to take issue with the choice of a second person narrator, a traditionally unpopular form. However, Chuck Comeau expressed that as a parent, he had a hard time connecting with the emotion of the character, even though he understood that the context of Suzanne’s life was very different from his own. Truesdale mounted a valiant defence of his book’s unlikeable protagonist, despite the fact that his own father abandoned him at the age of two. Truesdale argued that Suzanne is not about excusing her actions, but about contextualizing her decisions, and Barbeau-Lavalette’s journey of understanding and forgiveness. It is a deeply humanizing act of artistic transformation. He found an ally in Lisa Ray, who suggested that as actors, the two were able to embrace Suzanne’s character and find a way into her pain without judging her. She also argued that no one would judge a male artist, such as Picasso, so harshly for making a similar choice, and Truesdale pointed to the father, Marcel Barbeau, as just such an example. When the ballots were cast, Truesdale voted against By Chance Alone, arguing that it was less powerful than some of the others. Brother received one strike from Joe Zee, who said he changed his vote from Suzanne because he was persuaded by Lisa Ray’s argument that we would not judge a man the same way. Ray cast her own vote against Homes, while Chuck Comeau called out Suzanne, again saying that her actions were inconceivable to him. This put the deciding vote in Ziya Tong’s hands, and she made Suzanne the second book to be voted off of Canada Reads 2019. Catch up with Canada Reads 2019 starting here!